Every book has its own texture, materiality, and topography. This is not only metaphorical; the process of creating a novel produces all sorts of flotsam–notes, sketches, research, drafts–and sifting through this detritus can provide insight both into the architecture of a work and into the practice of writing. Blunderbuss is excited to run this series, in which we ask writers to select and assemble the artifacts of a book in a way that they find meaningful and revealing. In this installment, Lynn Steger Strong reflects on the walks, runs, and bookstores that helped her write her debut novel Hold Still, released in March by Liverlight/WW Norton. 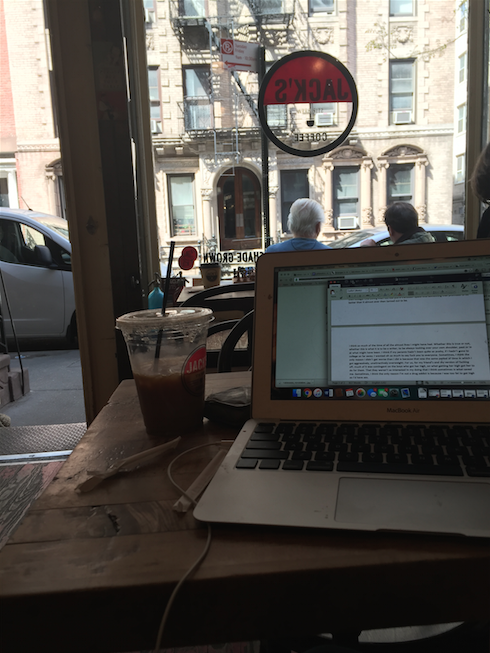 I wrote most of my novel at coffee shops. I can’t stand quiet when I’m writing. I like life and noise and action all around. I like to look up from the work and watch people interacting; I like to eavesdrop on snippets of conversation and steal the cadences of people’s language. 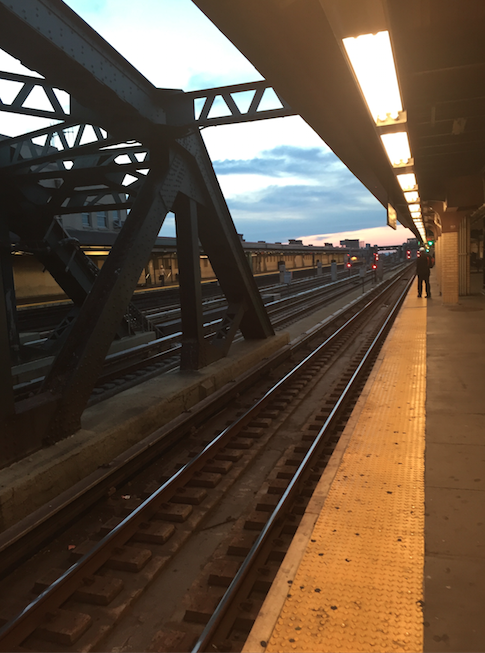 I like burrowing into the work, even while there is so much to distract me: it’s only when I’ve missed my subway stop or been jarred out by someone tapping me on the shoulder, that I know I’m finally inside the work the way I want to be. I need to move constantly when I’m writing. Most of the writing of this book took place between runs and walks, for the two or three or four hour stretches that I could force myself to sit still before I had to move again. In summer, when I didn’t have to teach and when my husband was around to help with our daughters, I’d get up at 5 or 6 and run somewhere between 5 and 15 miles. I’d take the subway into the city and sit and work until I couldn’t anymore. Then I’d walk and walk until I’d moved enough that I might get to work again. I take notes on my phone when I’m running, write in notebooks on the subway or in parks. I have very little recollection of the actual sitting I did to write this book; I remember shaking legs under coffee shop tables and very brisk walks of sometimes hundreds of blocks until I might sit still long enough to get things down again. I am a writer who needs always to be reading. The best part, to me, about writing is feeling as if I am in a sort of conversation with all those who came before. 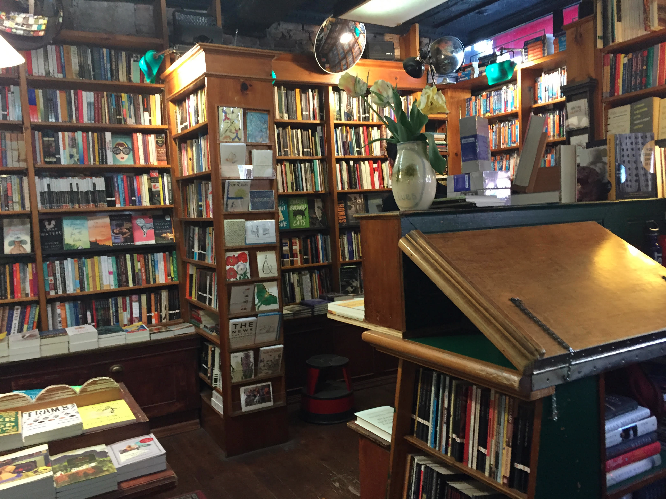 Just down the street from the coffee shop where I do much of my writing is one of my favorite bookshops, favorite spaces really, in the world, Three Lives and Co. I discovered so many writers I would have never known about were it not for them and their thoughtfully cultivated tables: Jim Crace, Lidia Yuknavitch, Rebecca Lee. It’s a gorgeous bookshop, small with dark wood and little nooks inside of it, with an impossibly well-informed and friendly staff. I used to go there even when I couldn’t afford to buy anything, back during my first stint in New York. They let me, no doubt unwashed and mopey, loiter in the corner for hours and never kicked me out. My book alternates between two different characters and two different timelines, and I came to believe that the transitions between these chapters, the way that they were both speaking to one another and sometimes failing to, held as much of the plot as the chapters themselves. 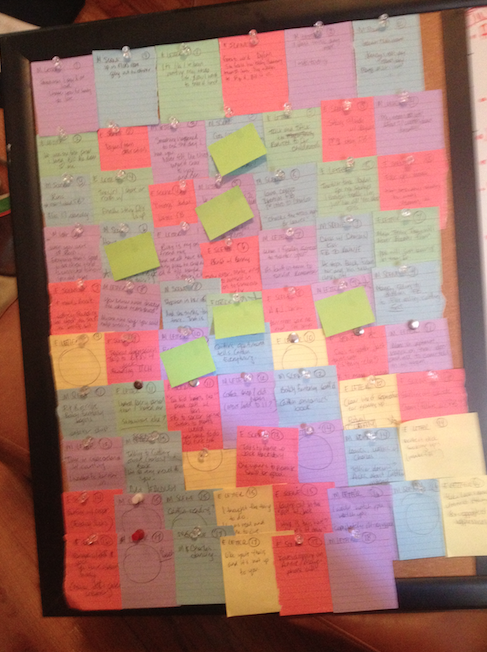 So, after one of the many drafts, when I was feeling incapable of looking at the sentences any longer, I made this board of colored index cards. I wrote a brief summary of what happened in every chapter, then arranged them as they were inside the book. I looked at this for maybe three days before setting it behind a desk, mostly forgotten, but that image in my head—of all of it together—helped me to figure out the conversation between the sections, what I hoped each moment of transition would offer that would make the book stronger than simply the sum of all its parts. For me, the hardest part of writing is the work you have to do not-writing: the thinking, the walking, the talking to brilliant friends with no end in mind. This is such a necessary part for me, but also the hardest part to make space for when you have normal life responsibilities like jobs, kids, rent. 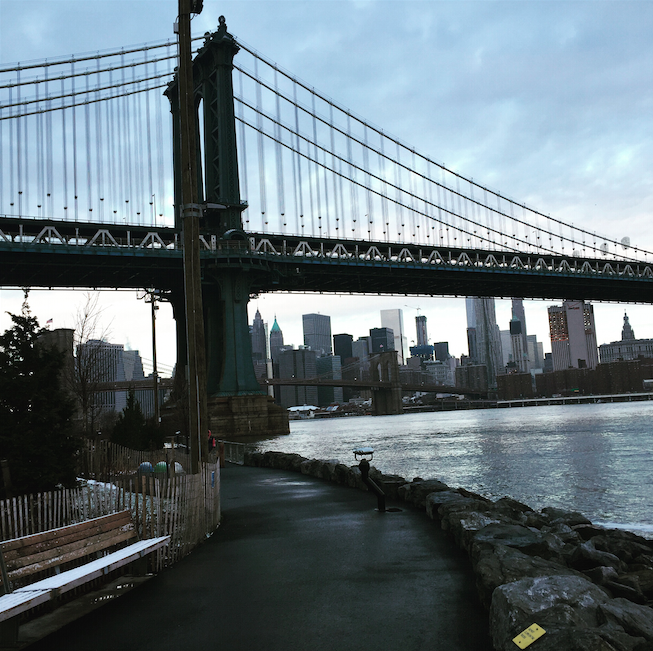 For all of that, I am eternally grateful to New York for forcing this sort of space upon me in ways other lives might not: subway rides, walks with our kids, taking the dog to the park. There is all this time that is both productive and mindless, time that might be filled with plot planning, character making, building worlds inside your head. 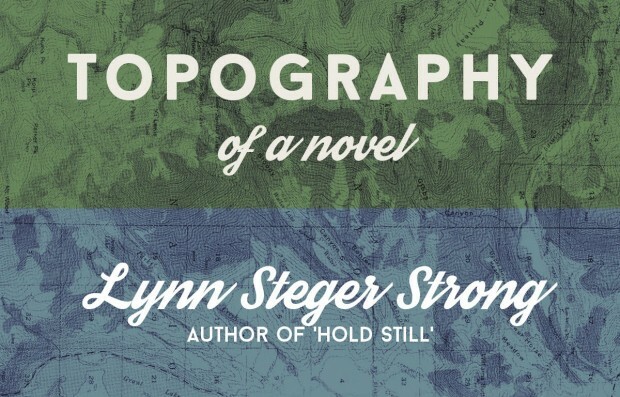 Lynn Steger Strong's first novel, HOLD STILL, was published by Liveright/WW Norton in March. 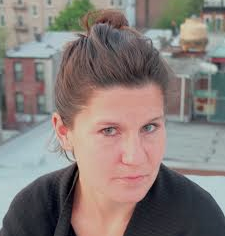 She teaches writing at Columbia and Pratt and lives in Brooklyn with her family.